Life available now. Some reassembly required. Why is it called Junkyard Salvation? When a car gets totaled in a wreck, what remains is carted off to a junkyard. If you’re able to restore the car from a junkyard wreck back into working condition, you can register the car, but it legally must be identified as “salvaged.” I am questioning the foundations of Christianity and salvation in order to get my faith (and other damaged elements of my life) back into working condition. No other title fits. What’s the goal of this blog? I’m in a season where I’m learning a lot of life lessons, one stacked and overlapped atop another. It’s too much to remember. If I write it down cogently and succinctly, then (1) I can re-read it and not have to re-learn the lesson, and (2) someone else can read it and skip a step. I grew up in an A.M.E. church. Switched to a non-denominational church. Went to college, joined another non-denominational church. Left that one and helped start a new non-denominational church. In the course of serving in ministry, my faith in God, faith in people, and faith in myself suffered several lacerations which lead me to abruptly quit everything. I have no intention of joining another church until I understand how my faith works and how it’s supposed to work for me. Why isn’t there more scripture in your posts? There is a temptation to include scripture references in order to be accepted by Christians who only believe in the Bible. That is not the type of audience I’m catering to. My goal is to make sure truth and wisdom are more present. I include scripture only when directly relevant to the discussion topic. I love people, but they get on my nerves. I don’t believe in faith healing. I try to judge myself as harshly as I judge others. I do not like attending church. I do not like reading the bible. I do not like preachers. I have no passion for evangelism or missions. I recognize God’s appearance in both the sacred and the secular. I curse a lot. I desire an honest and unfabricated relationship with Jesus Christ. I am not an ideal Christian. I am an actual one. Mark Chappelle is a musician, singer, graphic artist, writer, composer, and balance artist who intends to push all of these abilities to their limits in his lifetime. 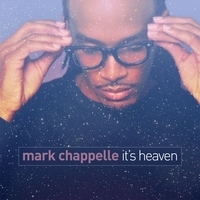 His debut single “It’s Heaven” is available on iTunes, Amazon, and other digital retailers everywhere. The problem is that people think an ideal Christian is the only kind of Christian there is. This leads to a lot of disappointment for them and frustration for the rest of us who are messy, confused, and finding furniture in the dark with our shins. We’re still Christians. From the ones with the prettiest lives down to the ones whose lives were beaten with an ugly stick. Jesus loves us. Everybody else needs to work on getting with the program. So what is the program? What’s the program? You just showed up to it. Talking about it. Making it uncomfortable for elephants to stay in the room. Becoming a forum to examine issues and get feedback. I’ve gotten some amazing responses to tough questions. Look at the comments I received asking if being smart and saved were mutually exclusive. I was SO encouraged. I want that stuff to keep happening! How did I not know that you had a blog? Thanks to Montrelle for bringing it to my attention! Love your info page. I work as a youth pastor in a more “progressive” denomination. And there’s a lot of people around the country and world who are on this same journey. I was. For me, it was more about finding a community than it was becoming a member a church. I stayed connected to a community of transparent believers and grew more than when I decided to become a upright member of a church. I’m hopeful because I see many churches moving in that direction. They’re just not the conventional, traditional, or popular ones. I stood alone for a long time trying to figure my faith out. Then, I found a real community of faith. That’s when I began really growing in my faith. Daily I’m seeing how this faith thing works. Praying the same for you on your journey man! It’s great that you mention that! Since leaving church, the thing I have missed most is community. So I substitute wherever I can (thought I still visit my old church infrequently). But to your point, I try to make sure I come in contact with “transparent believers” and give an opportunity for some iron to sharpen my iron. So far, God’s put some really awesome people on my wackily shaped path. And thank you for your prayers! Just discovered your blog via an unrelated search….but very glad I found it! (maybe it was a “God thing”…hmmm) My current experience is similar to yours. Looking forward to reading all the past entries, and participating.Thanks. Hey Dave, thanks for stopping by and making yourself known. I look forward to hearing from you. I’m curious to know what search lead you here! Well Mark, it was a combination of some of my odd interests. I like old cars, and I also like photography…particularly photography of abandoned places, buildings, etc. I am also a Christian, and play guitar in a praise band. I think I had searched the phrase “abandoned junkyard”. So of course, when I saw “Junkyard Salvation” I was immediately interested. As I began to read your posts, I was…comforted…for lack of a better word….by your honesty about your faith.You are an excellent writer! Many of the experiences you have so powerfully described I can relate to. More along the lines of God’s silence in my suffering. I like this place. I feel safe here. Haha! That’s pretty cool! I searched for “abandoned junkyard” myself and didn’t see my site pop up in 8 pages of clicking, so many you really were supposed to stumble upon it. Thank you for the compliments. And for the record of them, “I feel safe here” is even more flattering than “you’re an excellent writer.” Thank you SO much. Again… welcome, and don’t be a stranger! What a fantastic mission, this blog. I have a friend with whom I always talk about the idea of finding our “home church”: she, in reference to trying to find an actual church in her Washington, D.C. suburb where she and her family can pray and join a community; me, in reference to trying to find the home for myself — mentally, emotionally, motivationally — where I am closest to God and my best idea of myself (i.e. closest to God). So yeah, I get this. Sorry to meet you via Ferguson Tweets; happy to meet you through the vitally important conversations we are having about how America is failing its very ideals… how America is searching for its home church as well… Namaste. When I first left my church, it seemed like I was leaving in order to find “home.” I used to be closest to God there, but for me… he moved away from there and I needed to go start looking for him. It’s amazing to me. I often forget that was my goal until someone like you says something like you did and it refocuses me. I’m sorry Ferguson happened as well (It’s still happening NOW</em), but I'm always grateful to lock arms with fellow seekers and questioners who, through the weeds of their doubts, STILL want to stay connected to God. Thank you so much for contacting me today. Looks like you have some virtual church / community going here… We all need to get “fellowship” somehow. Call it what you like. Maybe you are like Rick in the movie Casablanca. Burned fighting with the resistance. I hope you get a new vision to serve. “Here’s looking at you kid.” May God Bless your art. Jake! Thank you, sir! This has in a sense become my little community of believers and doubters. I seem to bridge the gap between them both. Thank you for stopping by, reading, and commenting. I hope I get renewed vision too. Please come back again. I have read a couple of your posts, most definitely relate to the journey of being Christian and seeking truth. There’s comfort in hearing the struggles of others that resemble our own. Especially other beilevers, because revealing your true self in church can cause you to be damned to hell before death. Lol. I digress, thank you for sharing your true self. Love and light to you on your journey. Thank you for reminding me that someone is listening and these stories matter. I’ve been considering blogging here again. Comments like this help immensely. God bless you. It is way too late for me to be up typing strangers but I don’t want to lose the moment. I found your blog Mark, when I googled “by your side, Sade, Jesus”? The song has been singing me for three days or so…oh I could say so much…it’s all I have left of an aching heartbreak.but in the wreckage I found that I was changed for the better. I could sing that song. I had, for the first time ever in a romantic relationship demonstrated it, in my own character, for a sustained length of time. I can saw without equivocation that this particular (relatively minor) transformation occurred as a result of massive payer where i remained close to Jesusaand was ruthlessly honest in his presence in the Jesus is my homeboy kind of sense–almost irreverent but only because I was so real despite the fact that that includes mugh foul language and a totally checkered past–also had truthful weekly prayer and convos with authentic friends who try to do the scripture..on and on. But tonight, still quite limp-hearted before falling asleep i had the thought to turn the words. What if I can truly believe that Jesus might sing Sade’s song to me? Revolutionary. –In the sense that if I learned this compassion, this humble love from him then possibly a great many of the judgmental, derisive thoughts I associate with the Jesus-voice-in-my-head are not of or him. Sigh. So frustrating the journey to faith. So unnerving so regularly. But for some reason, yesterday and today, for long stretches of time. I felt so good, like transformed and able to do good. And that gave me such pleasure. Back to admiration–I don’t know yet how to quite put into words my sense of following this bright stark light that is Jesus. It’s risky. It’s dangerous. It’s sweet. It’s merciful. It stoops. I think that’s my favorite. Jesus stoops. I’lI stop here. I hope to remember your site. You’ve inspired me tonight and your writing on Sade was a friend to my lonely spirit. Thank you. All posts are written by Mark Chappelle, except where noted. None of it is fiction. Please visit the reader's guide to check out the highlights or just start at the first entry. Whether you strongly agree or disagree, please leave a comment. I don't know everything. I welcome the help. And if you know anyone you think should read this or has had similar experiences, please share the link with them.